His sister, Anamarie Pasdar, is a theatrical artistic director and producer. Pasdar married musician Natalie Maines of the Dixie Chicks on June 24, 2000. They have two sons, Jackson Slade Pasdar (born March 15, 2001) and Beckett Finn Pasdar (born July 14, 2004). On July 5, 2017, Maines announced that she and Pasdar are divorcing after 17 years of marriage. ^ a b "Adrian Pasdar Biography". TVGuide.com. Archived from the original on November 17, 2015. Retrieved July 4, 2017. ^ a b c d "Adrian Pasdar Biography (1965?-)". Filmreference.com. Retrieved 2010-06-15. Source notes that some sources gives birth year as 1967. ^ a b c "'Iron Man': 'Heroes' flying man Adrian Pasdar takes on anime". Hero Complex. ^ "Pittsfield's Grammy girls". Berkshire Eagle, The. 2007-02-13. ^ Pasdar, quoted in "Adrian Pasdar's television, film career working in Mysterious Ways" Archived 2007-03-27 at the Wayback Machine by Bridget Byrne. Chicago Sun-Times. August 13, 2000. ^ Maddox, Dante. "Heroes Season Finale: Adrian Pasdar". Craveonline.com. Archived from the original on 2007-10-07. Retrieved 2010-06-15. ^ Keveney, Bill (2009-11-30). "Adrian Pasdar 'never better,' 'Heroes' character never deader". Usatoday.com. Retrieved 2010-06-15. ^ "Marvel Television Announces Adrian Pasdar & Milo Ventimiglia For Iron Man & Wolverine Anime Series To Air On G4 July 2011" (Press Release). Anime News Network. 2011-04-03. ^ "Amazon Not Moving Forward with Chris Carter's The After - Dread Central". www.dreadcentral.com. ^ Bucksbaum, Sydney (July 22, 2017). "DC TV Watch at Comic-Con: All the Highlights From 'Supergirl,' 'Black Lightning,' 'Arrow' and More". The Hollywood Reporter. Retrieved July 26, 2017. ^ "Names &". The Washington Post. March 17, 2001. Archived from the original on July 4, 2017. Retrieved July 4, 2017. ^ "Natalie Maines gives birth to baby boy". Today. Associated Press. July 23, 2004. Retrieved July 4, 2017. ^ "Natalie Maines, Adrian Pasdar Divorce: What Went Wrong?". www.christianpost.com. ^ "Natalie Maines Files For Divorce From Adrian Pasdar After 17-Year Marriage". ^ "Band From TV Charities". Bandfromtv.org. Archived from the original on 29 July 2010. Retrieved 2010-06-15. ^ "Saturn Award Winners 2009". Archived from the original on 2009-07-11. Retrieved 2010-06-15. ^ "Band From TV News". Bandfromtv.org. 2009-05-31. Archived from the original on 2010-01-06. Retrieved 2010-06-15. ^ Richmond, Ray (25 March 1999). "Mutiny". ^ "Flight of the Iron Spider". Ultimate Spider-Man. Season 1. Episode 5. April 22, 2012. Disney XD. ^ "The Avengers Protocol". Avengers Assemble. Season 1. Episode 1. May 26, 2013. Disney XD. ^ "Crime and Circuses". Avengers Assemble. Season 1. Episode 24. May 11, 2014. Disney XD. ^ "Listen to Queer Fish audio book read by Adrian Pasdar!". legendpress.co.uk. 2010-02-20. Archived from the original on 2011-08-16. Retrieved 2011-02-27. 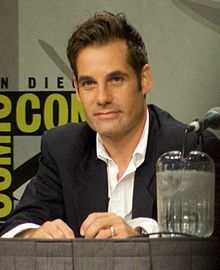 Wikimedia Commons has media related to Adrian Pasdar.